After a full year away from this space, what brought me back? To tell you the truth, I wasn’t sure I would come back. The longer the time passed, the harder it felt to just start. Life since my last post in September last year was insane. A 6 week stint working a whole lot on my photography business. Then school holidays, then came four intense, crazy, amazing months, in my essential oil business, which included more flights than I’d had in the past decade, and around 4500km on the road. Crazy. In amongst all that, we started homeschooling our three eldest children (the youngest is still at preschool, but will be homeschooled from either next year or the year after). Crafting, blogging, my time, all took a back seat to life and mothering and wifing and working. Then, a couple of weeks ago, I was chatting to Car, and I happened to say “do you know what I miss? I miss the good old days, where everyone would chat and we would blog and we would actually Get Stuff Done”. It stuck, this idea of the good old days being gone and lost, and then it hit me. I am in charge of that. I have the power to make NOW, the good days, the power to bring back the magic and do what feeds my soul and makes those memories that will warm my heart in the long distant future. What is it about those days I yearn for? Friends. Craft. Soaking up the sunshine with my loves. Getting out from behind a screen…ironically increasing my blogging is part of it. Crafting CONSTANTLY. As I mulled over what I wanted to bring back into my life, to find some kind of balance, I flicked through some bookmarks on my old iPad. It brought me to a post from one of my favourite bloggers of 2012, back in the heyday of blogging. Tick tick tick went the inspiration, and quicker than you can say “I have this idea…”, I’d shared a screenshot and we were down the challenge rabbit hole. Again. 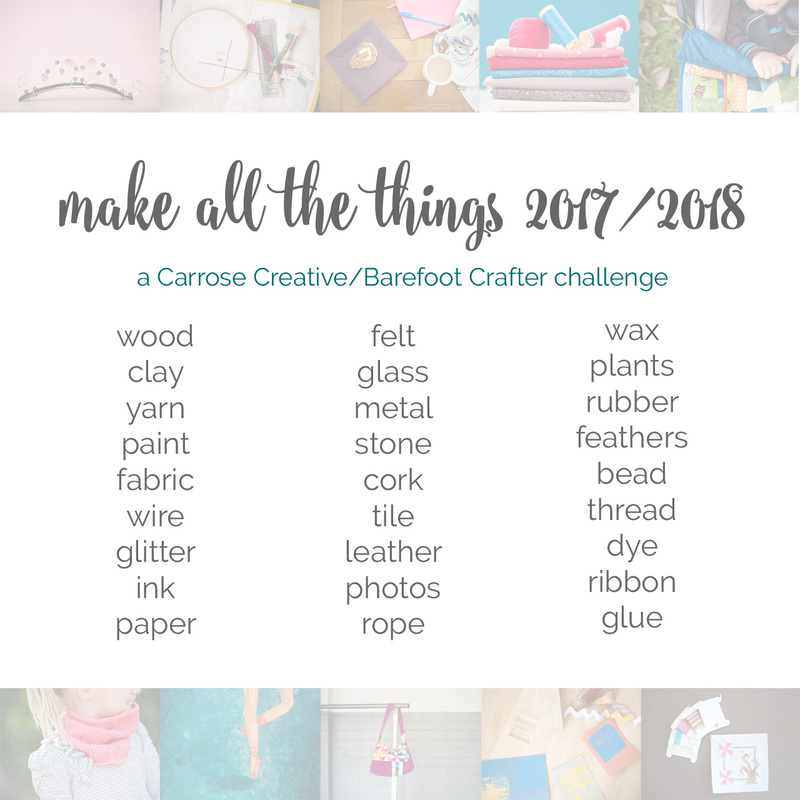 The Make All The Things Challenge. Over the next 15 or so months, up to the end of 2018, Car & I will attempt to make 26 projects, using 26 of the 27 materials on the list. That works out at one project every 3 weeks. The excluded material is individual choice, and in my case, whichever ends up in the too hard basket!! I am slowly percolating ideas of what I will make for each option, and can’t wait to get cracking. We will be sharing over on instagram, and I, of course, will be blogging my projects. I am so excited to be back in the crafty game. 65 weeks. 26 projects. Let the crafting begin. Can’t wait to see what you 2 come up with! Good luck, it sounds hard – but fun! It’s going to be lots of fun!! My mind is swirling with ideas!! Cannot wait to begin! probably this week YAH!! !